Ironwear® is the leading designer and manufacture of wearable weights for children. If you do not see what you want please contact us. Our website only shows a fraction of the products we produce. We often create new products to solve individual customer needs. We are here to help. Ironwear® founder was the first to pioneer wearable weights for children for motor development and strength training. Over 20 years ago, he first created wearable weights for his own children to help in their development, he then began offering hand weights, ankle weights and weighted vest to physical therapists and sports trainers. The open palm hand weights were quickly accepted to help in the motor development for children with writing problem. At first the weighted vest were rejected by everyone, but slowly over the past 10 years they gained wide acceptance as a viable tool to help in a child development. Ionwear®’s children’s products are designed to be the safest, most durable and most comfortable. Our state of the art soft flexible Flex-Metal® weights bend and move with your child to make the products the safest on the market. Our adjustment systems assure that the products adjust to fit your child well now and continues to fit them well as they grow. Speed Vest®s come in four different sizes. 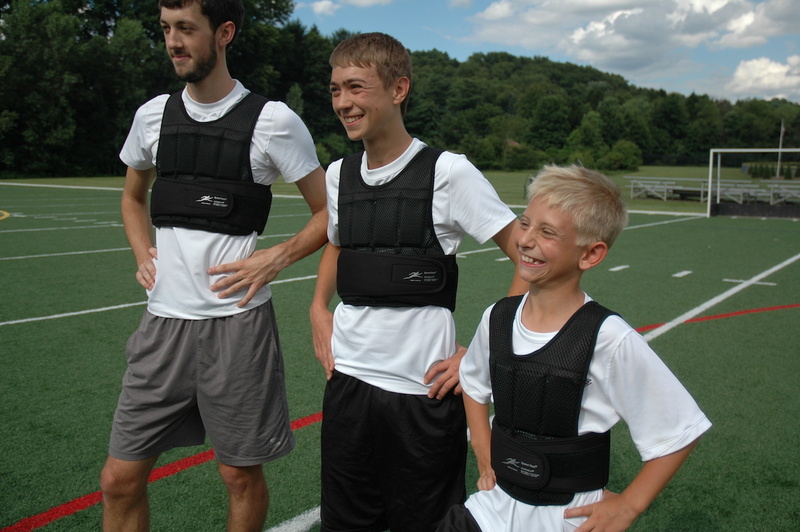 Shown above is the adult Speed Vest® on the left, the Jr. Speed Vest® in the middle for teenagers and the Medium Speed Vest® for middle school age on the right. We also make an XL Speed Vest for chest sizes 36 to 54. Please click on the more information link below to learn more about using and selecting the right size weights.